Addressing military personnel at a “Civic-Military Patriotic March” commemorating the 27th anniversary of Hugo Chávez’s failed 1992 coup d’état in the state of Aragua, Maduro pushed back on recent comments by President Donald Trump that the U.S. had not ruled out a military option in its efforts to remove Maduro from power. Maduro did not address the fact that he is no longer Venezuela’s head of state following the invocation of Articles 333 and 350 of the Venezuelan constitution to oust him and replace him with interim President Juan Guaidó. Dozens of democratic countries around the world, led by the United States, recognized Guaidó as Venezuela’s legitimate president following his inauguration last month. This weekend, the United States sent humanitarian aid envoys intended to help the millions of people suffering under the Maduro regime, although aid workers remain unable to access people inside the country as the Venezuelan military continues to block their entry. Instead, those in need of assistance are required to cross the border to checkpoints in Colombian and Brazilian border towns to access the necessary aid. Over recent years, Maduro has made repeated grandiose threats against Trump and the United States. In December, he warned that Americans troops would “not make it out alive” should they illegally enter the country. 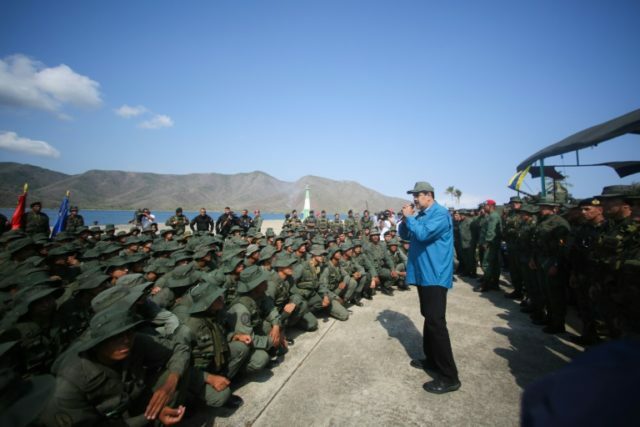 “You must be ready to go to the heart of the enemy who dares touch Venezuelan soil – to go to the heart of the enemy and to tear out his heart in his own territory,” he told soldiers at another military parade in Caracas.